Lyndon Johnson famously said "Whenever most Senators look in a mirror, they see a president.” The sentiment has been quoted, plagiarized and paraphrased by politicians and political pundits ever since. Both Kennedy and Johnson were Senators before they were elected President and Vice President in 1962. While many Senators have run for president since Johnson served, none fulfilled that ambition until the election of Barack Obama in 2008. "Whenever most billionaires look in a mirror, they see a president." I'll say it again. Why not? It is worth noting that presidential campaign strategists don’t have a lot of imagination. They mostly fight the last war. 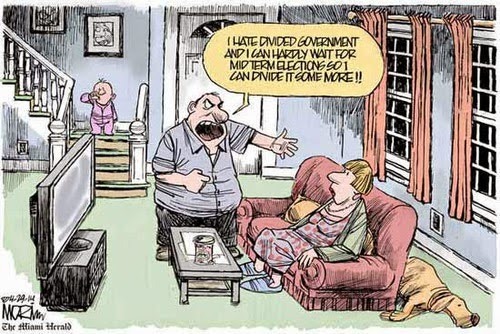 Whatever worked in the last election becomes the template for what to do in the next election – only bigger and better. And what worked in the last election is this: A rich, blustering, boorish, but successful huckster/entertainer with absolutely no political experience and limited understanding of governing, foreign policy, or the constitutional framework of the United States was elected President of the United States. That happened. And when that happened the pool of future President wannabes got exponentially bigger. This is not an original thought. Across social and mainstream media you can find many lists touting billionaires and celebrities who look in the mirror and see the next President of the United States. Examples include CNBC, People Magazine, INC, Observer, and Newsweek. Some will indeed run. In the brave new world of the Trump era, how do we separate the contenders from the pretenders? 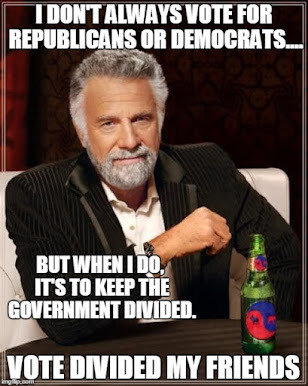 As a public service, the Dividist will take a stab at sorting this out. 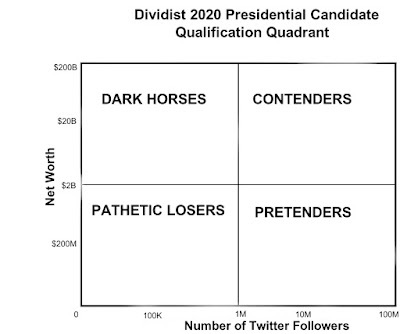 We'll start by culling a list from the vast herd of billionaire candidates being bandied about, then look at quantifying their chances. Important criteria for inclusion include wealth and... well... that's pretty much it. 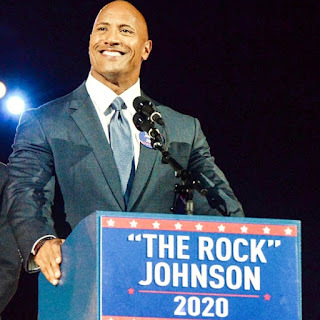 We won't look at whether they are Republican, Democrat, or Independent, as we can expect billionaires and celebrities from across the political spectrum to run. We expect Republican billionaires to be crawling all over each other to challenge the incumbent President Trump in primaries (if he's still President) or Pence (if he is not). We also won't consider whether they themselves are saying that they will run. We know that three years out, all potential candidates lie about their intentions. At this stage, denial of presidential ambitions is a virtual confirmation that they will run. 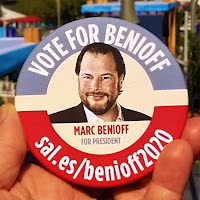 Marc Benioff - Founder and CEO of San Francisco based Salesforce. His frequent forays into politically correct social justice issues may antagonize red states like Georgia, Indiana, and North Carolina, but it makes him every Progressive's favorite billionaire. 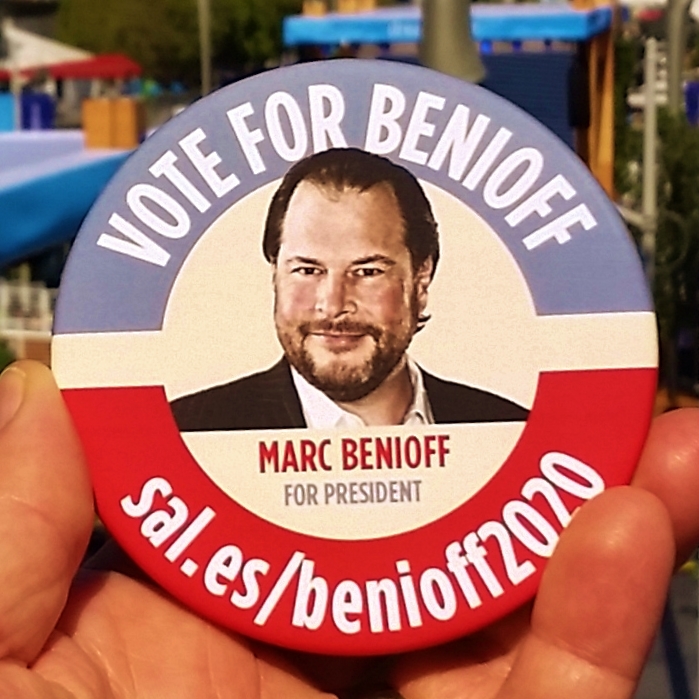 He's not indicated an interest in running but you wouldn't know it from the Twitter #Benioff2020 hashtag. 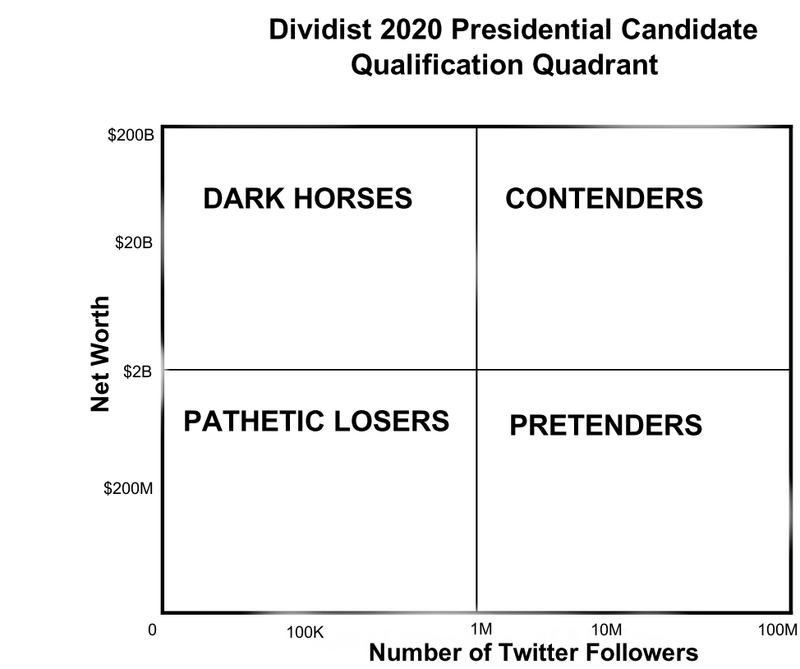 He remains the Dividist Billionaire Dark Horse candidate for 2020. Mike Bloomberg - Former Mayor of New York and perennial billionaire favorite of the Centrist/Moderate/Independent "We need a 3rd party!" set. He's always interested but never seems to pull the trigger. He stepped back from running as an Independent in 2016 because he feared it would damage Hillary Clinton's prospects versus Donald Trump. How did that work out? Mark Cuban - Done deal. He is dithering but he is going to run as a Republican alternative to President Trump. Like Donald Trump, he has billions, a reality TV show, twitter followers in the millions, and something that Trump does not - a professional basketball team. What's not to like? Dwayne "The Rock" Johnson - You got me. People think he might run, and he seems to want to run. People like his movies, and this is the era of Trump, so who knows? Bob Iger - Chairman and CEO of Disney Corporation. 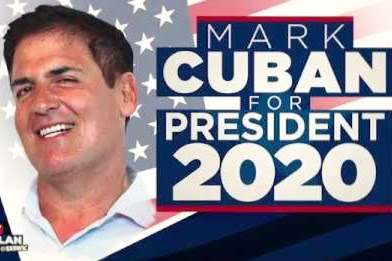 He talks like politician, postures like a politician, looks like a politician, and declared he is retiring from Disney in 2019, which is the perfect time to launch a 2020 campaign for something. Maybe President. UPDATE: A few weeks after after we published this post and ranked Bob Iger as having the worst prospects in the "Pathetic Loser" Quadrant, he announced he would stay at Disney to shepherd the Disney/Fox mega merger. Coincidence? You decide. Sheryl Sandberg - COO of Facebook, smart, articulate, tech executive extraordinaire, author, and spokesperson for a feminist perspective that many feel is sorely lacking in the halls of power. She says she's not running. We'll see. Howard Schultz made coffee great again, why couldn't he do the same for America after Trump? Apparently, he's intrigued. Tom Steyer made a fortune running a hedge fund and now he wants to save the world. Presumably because running a hedge fund and running the United States is pretty much the same thing. But before running for President, he needs national name recognition. Spending millions on television ads collecting an e-mail list to impeach President Trump might get him there. 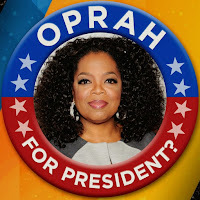 Oprah Winfrey - Michael Moore thinks that Democrats should run someone that people love - specificall someone like Oprah Winfrey. 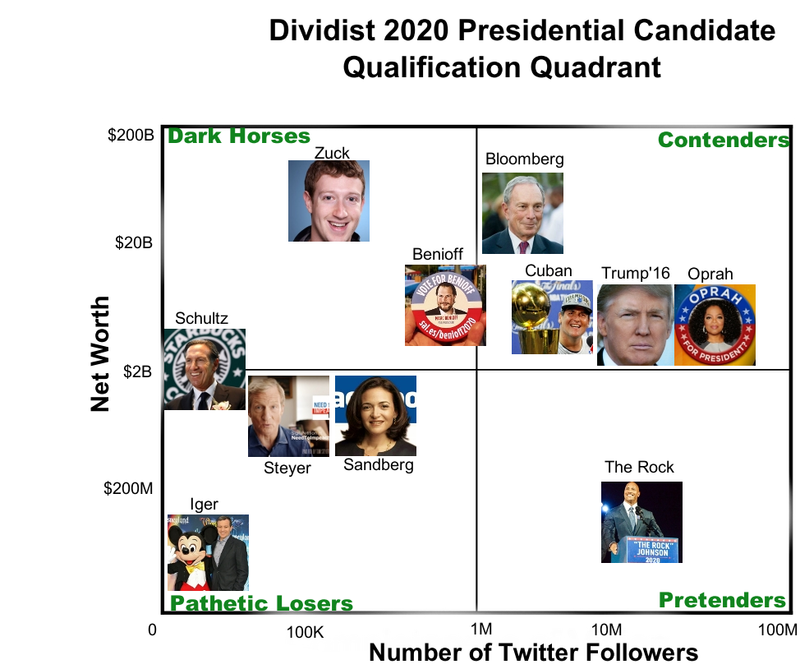 Oprah has as many twitter followers and as much money as Donald Trump. She also has her "OWN" TV network, which trumps Trump's pathetic reality TV show. She just needs a little more gravitas. Perhaps by doing something like covering serious news stories on 60 Minutes. UPDATE: Or perhaps by delivering an inspiring, barn-burner of a a speech in front of a global audience at the Golden Globes. 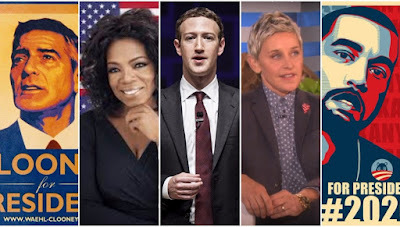 Mark Zuckerberg is probably on his way to becoming the richest man in the United States. He toured all 50 states last year just to relate to average Americans. And Facebook knows everything about everyone, so we might as well make him President. We'll add the numbers for both President Trump and Candidate Trump as a control group for comparison purposes. 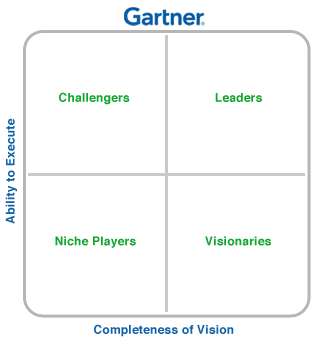 The threshold for making it into the Contender quadrant is $2 Billion net worth and 1 Million twitter followers. We're still early. 2020 is three years away. There is plenty of time for our billionaire wannabes to improve (or lose) their position. Benioff is likely to clear the million twitter follower threshold in the next year and Sandberg's Facebook stock could propel her over the $2B barrier. It's likely we'll see prospective billionaire/celebrity candidates enter or fall out of the running. It's a start, but we can come to some conclusions immediately. Mark Cuban has a chance. Bob Iger should give it up. Not enough money. Not enough Twitter. Howard Schultz needs to sign up on Twitter. The Rock is going to need a few more blockbusters and a lot more money. Michael Moore is right. 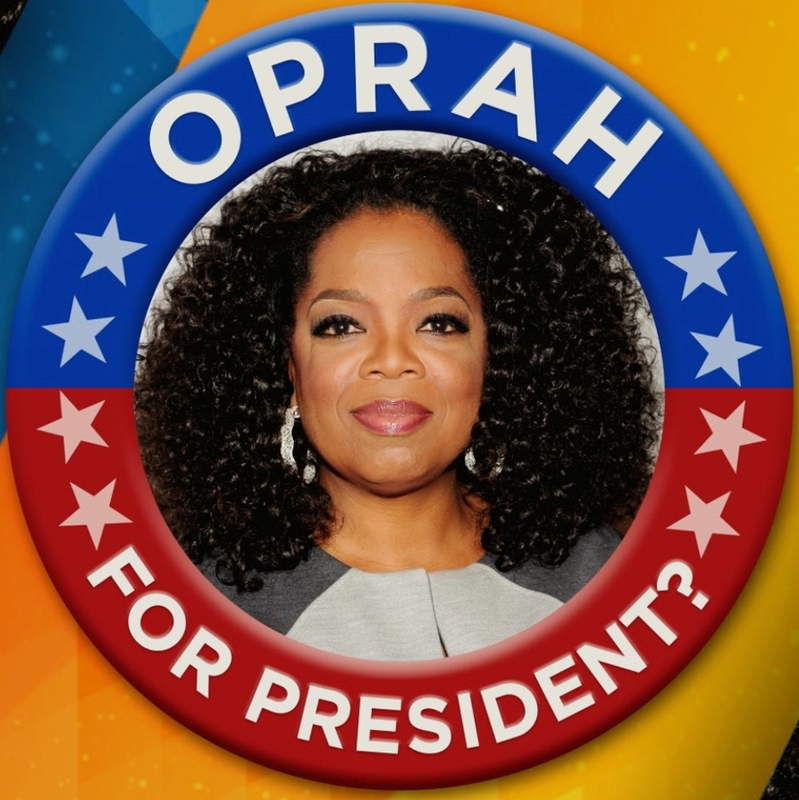 The DNC needs to get Oprah on the phone. Tom Steyer should set his sights lower - maybe California Senator or Governor. He'll lose, but it won't be so humiliating.